Interested in getting started with uphill skiing (aka "skinning" or "ski touring")? Follow these 6 tips from skimo enthusiast, Thomas Woodson. Let’s send it. If you aren’t skiing uphill, chances are most of your endurance junkie friends are — or are at least talking about it non-stop. Ski mountaineering races and uphill skiing are the ultimate way to gain some aerobic fitness and log solid training hours at altitude. But all this doesn’t come without a steep (puns) learning curve. Here are some tips to help you dial in your uphill program. 1. What the heck is all this gear? For the speedy end of the uphill spectrum, most skiers are on 161cm race skis with a minimal and ultralight tech binding (200-500g). The boots (500-1000g) attach at the toe pivots to rotate as you skin (walk) uphill, but locks down into heel pins when the binding is rotated. Skinning uphill is possible thanks to skins stuck to the bottom of the skis, which are pulled off for the descent. This isn’t always easy. Your body temperature can skyrocket on the ascent, and plummet on the descent. Layer on the cold side and move to warm up. Overdressing and sweating through base layers can make you much colder later on. Legs: A thin pair of softshell pants, typically without a baselayer. Body: Wool shirt, light midlayer or wind jacket, and a puffy jacket for the downhill. Hands: thin gloves for the uphill, warm gloves for the down. Mittens with removable wind shells can be a good all-in-one solution. For racing, speed suits are definitely the way to go. The fabric dumps heat and blocks wind. There are pockets for your skins and all your snacks. Most importantly, there are holes for your boot buckles to pass through which enable faster transitions. The goal here is long smooth strides. Your skis need to be on or just barely above the snow as you take your next step. Focus on keeping your chin up and chest open for efficient breathing and body positioning. This activates more of your leg muscles and keeps your core nice and stable as well. If you’re a downhill skier, you may know about having your pole length be to where your arm bends at a 90º angle. For skimo, it’s better to extend your poles 10-20cm from that point. Use your wrist straps! When I’m transitioning, “boots, bindings, skins” repeats in my head. Bend down and simultaneously lock both of your boots into downhill ski mode, then twist (or flip) both bindings into downhill mode. Now for the awkward part… reach for the toe attachment of your first skin and rip it off backwards as you stand. As you finish, stomp your heel to the ground to lock into the binding. Fold and stuff your skin in your jacket and repeat on the second ski, then you are ready to shred. Note: It’s super important to keep your skins warm on the downhill. Trust me… frozen skins do not go on easily when you’re ready to go back uphill. Time to reverse it all! Reach down, unlock both boots simultaneously. Grab your first ski by the toe to unlock it from your boot, twist (or flip) your heel piece as you stand the ski up. Remove a skin from your jacket, hook the toe attachment, then pull it down to apply. Set it down, step in and lock your toe piece then repeat for the other side. None of this is possible without the fuel to keep you going. One crux—food and water can be difficult to consume in the cold. I keep Skratch Anytime Energy Bars and Sport Energy Chews in my pockets so they are warm and easy to eat. For water, most skimo packs have insulated bottle holders on the strap to encourage regular drinking. Longer format races can deem a hydration bladder necessary though, and the bite valves often freeze. Tuck the end of the hose into the top of your speedsuit or jacket and always blow your water back into the bladder. I try to have a bite and a few sips of Sport Hydration Drink Mix every 15 minutes or so, then I don’t have to mess with all that during transitions. If you have any questions, you can find me at a handful of the Colorado skimo races or running around at Eldora Mountain Resort. Always stoked to chat! 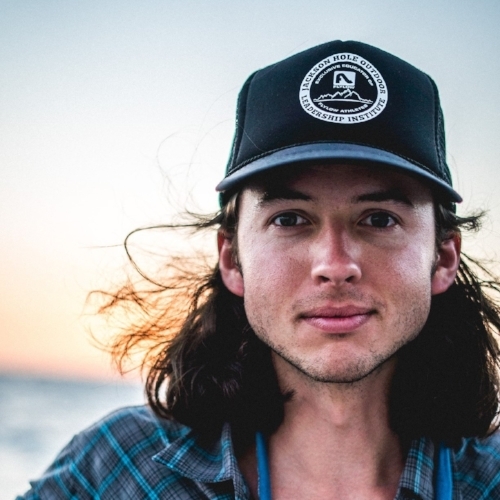 Thomas is a Boulder-based adventure photographer and filmmaker, creating most of his work human powered in the backcountry. Skimo training and racing help create a solid foundation for the months of winter and spring projects ahead. Follow his adventures on Instagram @thomaswoodson.